I thought last month was quite the month, but June proved even more eventful. First of all, I ran a half marathon (that’s 13 point one miles) in San Diego on June 4th. I’ve been training for 20 weeks and it was a great experience, especially since I did the run with Team in Training to raise funds for the Leukemia and Lymphoma Society. There were about 4,000 participants from around the country that came to San Diego for the full and half marathon with Team in Training. That’s a pretty good showing and about 20 percent of the nearly 20,000 runners and walkers in the event. We all had purple shirts and there was incredible support along the route from Team in Training mentors and coaches. It was awesome! I was also able to make it a mini-vacation for my family. My wife, Annette, and our two children, Kristen and Eric, accompanied me on the long drive from Albuquerque. Road trips are fertile ground for family stories and we have a few new ones now. While in San Diego we went to Sea World and the beach, plus they cheered me on my run. Later in this month it was a bittersweet trip to Kansas City (again a long drive with my family) to be bedside for my mother’s passing from cancer. I wrote about her in last month’s newsletter and it was really good to be with her and all of the family present as she left this earthly life for her heavenly reward. This month’s feature article has more to say about this experience. Her eyes were closed but a slight change came over her face. She lightly squeezed my arm and instantly I felt some peace. Mom was nearing death, but she knew I was there. "Annette, Kristen and Eric are here, too." Her eyes were closed, but there was a slight smile. Pancreatic cancer spreads rapidly. Mother had been diagnosed just three months prior and there were no treatment options. She’d been scheduled for surgery but when that day came the doctors found the cancer had spread to other areas of her body. At 75 and thirty-three years after a near death experience Mom didn’t want to go through chemotherapy or treatment that might prolong her already full life a few more months. She was ready and accepting of her imminent death. Her faith – like the Rock of Gibraltar – gave her assurance that she was about to go forth into a light, a love and an eternal peace. She was eagerly looking forward to the embrace of Jesus. "It’s just like stepping into the next room" she’d often told close friends. Death comes to us all. It’s as inevitable as our beginning birth. In fact, it is just another birth process. We know this intellectually, yet when faced with it we must learn to let go with more than our mind. Our hearts are broken and the loss we feel when a loved one dies is real. It should not be denied, although denial is part of our processing of the death experience. Mom was ready, she’d been ready for some time, and she was letting go. Soon she was at death’s door and ready to open it and step into the next room. One of the greatest gifts anyone can give my mother was expressing to all of us as she lay dying. Don’t be afraid. I love you so much. Love one another. Mom, even in her intense suffering, was a willing instrument of God’s message to simply love. If you find you are separated by distance from family, whether geographic miles or the painful separation of resentment, bitterness or anger, it can be resolved. I’m grateful that over the past ten years my mother and I enjoyed a rich and wonderful relationship. Although she lived in Kansas City with my Dad and me in Albuquerque with my family we still visited by phone and through her wonderful cards and letters. I still get a chuckle from the many times she’d apologize for not writing often enough. No, she wrote plenty often, far more than I did, and always with such tenderness and honesty. My brother Doug lives in Virginia with his wife, Susan, and dear four year old son, Joshua. They blessed me with the honor and responsibility of being his godfather. Doug, just a year and a half younger than me, has lived an extraordinary life, including time as a missionary in Africa. He knew the importance of going to see Mom and did what he had to do to leave work and fly out. He drove the point home to me to also come out, however possible. Thanks to the great kindness of my wife’s parents we made the long drive from Albuquerque in their car with financial support from them, too. My sister Leslie, God bless her, lives just down the street from my parents in Kansas City and her dear family have been a source of joy to my mom and dad. Yes, even through the growing pains that Shea and Kelsey have experienced in teenage years and young adulthood. Leslie, firstborn of the three children in our family, could regularly go to Mom for advice, support and fellowship. She lost a husband, Rob, to leukemia years ago and Mom was there during Rob’s final days to minister in her quiet, strong way. Now Leslie has a great second husband, Kipp, whose strength is humor and understanding. Nobody’s family is perfect, just as no one person is perfect. We’ve all had our ups and downs. I gave my mother a few gray hairs. In return she gave me discipline coupled with love and direction. In many ways I considered her my “unofficial” spiritual director, especially in recent years. She had the knack for sending me just the right book at just the right time. What a gift that she introduced me to the insight of Thomas Merton, Richard Rohr, Julian of Norwich, Thomas Keating, Kahlil Gibran and several other great spiritual seekers. I know she didn’t discover them on her own. Other friends and mentors pointed her to them and she was paying it forward. I was fortunate enough to visit my mom in May, over Mother’s Day weekend. Even though her cancer had weakened her considerably we were still able to talk and share. I struggled a bit over whether to reveal an experience I’d had not long before, but the Spirit kept prompting me and on Mother’s Day morning I was able to relate my “vision”, for lack of a better word, that came to me one morning while running. I’d been training for a half-marathon (which I completed June 4th in San Diego – running with Team in Training in support of the Leukemia & Lymphoma Society) and during this morning run in Albuquerque I felt that my mom was with me. In this spiritual experience she was small, like a doll, riding on my back as I ran towards the mountains. I sensed around us loved ones who had died cheering and encouraging my mother. They were waiting for her to join them in the presence of God. It was real and powerful and as I shared the experience to my mom with tears running down my face she suddenly sat up in bed and began praising God and quoting scripture. My dad, Tom (I’m named for him, just as he was named after his father), noted that my story allowed Mom to minister to me! Now is that not evidence of God working through His children? Our week was long and emotionally draining in Kansas City over those final days of Mom’s earthly life. We’d gathered around her bed a few times to sing, pray and say goodbye, but God’s time was not meeting our human expectations. Mom and Dad’s 55th wedding anniversary was June 14th and she lived through it despite our belief she wouldn’t. We had a grand dinner in her honor. The next day her breathing was shallower and raspy and surely that morning she would pass. No, she kept on. By noon Dad suggested we might all leave for a while. Maybe Mom needed time alone. Coincidentally at that time my sister got a call that her daughter Kelsey was in a car accident. Nothing major, but she had to go to the hospital to be checked out. Doug and Leslie went to the emergency room for a few hours. I went out and ran a couple of errands. When I returned to Mom’s room she seemed even closer to departing. Dad came in from outside where he’d been fixing the American Flag. It had mysteriously come loose from the rings holding it to the pole and slid to half-mast. Doug and Leslie returned and they all walked into the room where I was sitting next to Mom, along with dear friends Will and Carol Evans. And mom took her last breath. The time was just after four in the afternoon, 1614 military time -- 6-14, my parent’s wedding date, the one for the next day. The days that followed were hard, but our family was together doing what needed to be done and we had a beautiful funeral service. 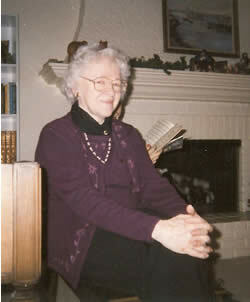 I miss my Mom, but I know in my heart that she has given us a great gift in her death with humility and dignity. She really let go with grace.